Members of the National Biodiesel Board governing board were recognized during the final session of the biodiesel conference in San Francisco Wednesday for their support and leadership of the organization and the industry. 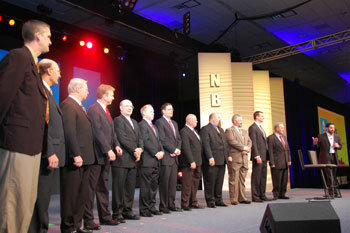 They include – from left to right – Chairman Ed Hegland, Vice-Chairman Gary Haer, Ed Ulch, Greg Anderson, Darryl Brinkmann, Greg Hopkins, Kris Kappenman, Denny Mauser, Doug Smith, Robert Stobaugh, Jeffrey Trucksess, and David Womack. Hopefully, I got them all right, but please correct me if I didn’t! I had a chance to interview both the Chairman and Vice Chairman about their thoughts on the conference, the state of the industry and the challenges and opportunities that lie ahead for biodiesel. I talked with Chairman Ed Hegland, who is a soybean grower from Minnesota who serves on his state’s Soybean Research and Promotion Council, during our Red and White cruise on the bay and we discussed a number of issues. Among them – the announcement at the conference about Volkswagen using biodiesel in 2009 Volkswagen Jetta TDI Racing Series, how San Francisco is a leader in biodiesel use, and how the stars who support biodiesel use help the industry. Vice Chairman Gary Haer with Renewable Energy Group (REG) sees lots of opportunities for biodiesel in the future, especially in the area of feedstock development and increasing oil content from soybeans. He also talked about support for biodiesel in the new administration and what the biodiesel board is doing in terms of prioritizing programs for the future.